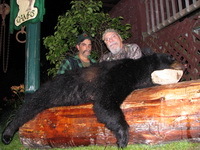 Bosebuck Mountain Camps offers a quality bear hunt over bait. We limit each of the four available weeks to no more than 6 hunters to be sure each person gets the attention they deserve for a quality hunt. We have access to a very large parcel of gated property, which had never been commercially hunted until 2004 by Bosebuck guests. This area has an abundant population of large bear in a mountainous, remote setting. Our strategically placed sites are equipped with double ladder stands that provide enough room even if you choose to have another person accompany you. Being located behind a gate allows us to offer bait hunting for all 4 weeks of the season without the worry of interferences. We have had several experienced hunters come and stay at Bosebuck who could not believe the size of the bear that they saw from our stands. Don’t be shy about asking for references as our previous guests are all too happy to share their experiences with you. This is a * six day hunt – in on Sunday, out on Sunday. Meals, lodging and cabin services are included. If you have a group of four, then the fourth is half price. Transportation to and from the sites, field dressing of the harvested animal and removal from the woods are all included. Arrangements for butchering services can be made, but butchering is not included. Licenses are not included. * Short on time but still want to hunt? Call and inquire about our three day hunts that may be available.